Recycling is defined as the process of converting waste materials into new objects and materials. It helps prevent potentially useful materials from going into landfills, reducing the need to use fresh raw materials. Recycling is also an excellent way to help reduce greenhouse gas emissions. Planet Ark, an Australian not-for-profit, has been celebrating National Recycling Week for 26 years and this year’s National Recycling Week will happen on 11 – 17 November. But, you don’t have to wait until November to start recycling. 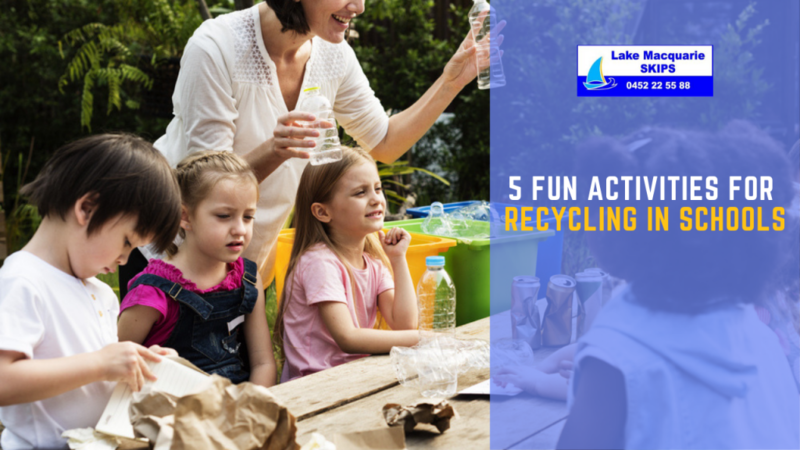 Below are 5 fun recycling activities that can be done in school. An activity that’s quite popular among kids and even many adults is ‘junk to funk’ projects. Australians are keen recyclers so finding items around the school and even at home for recycled art will be easy. Some common recycled art forms include collages, plastic bag knitting, wind chimes and toys made out of empty toilet rolls. Take this activity further by mounting an exhibit of all the recycled art created by the students. It will be interesting to see how resourceful the kids can be in coming up with their own artwork. Hold a recycling or re-use event. It can take on any form, like a swap party where the students can bring clean goods like old board games, a dress that no longer fits or a necklace that’s not their style anymore. These old items can be exchanged for other goods from other students. Instead of throwing them away, the students are encouraged to find a new home for them. Moving the learning outdoors can increase the students’ engagement with the topic. How about mounting a series of physical activities using recycled materials? You can have the students compete with each other to build a paper cup tower. Or have them shoot recycled straws at empty bottles from varying distances. Why not have them run through laid out old tyres? The games can be tailored to fit the age of the students and how physically challenging you want them to be. Invite a waste educator or a local composting expert to educate the students about recycling and to give them advice on how to practice a sustainable lifestyle. You can reach out to a council or even to a recycling company to help identify the appropriate speaker for your school. If you have a reuse or recycling organisation within your area, another option is to reach out to them for a guided tour of their operations. This gives the students a more interactive and hands-on experience with recycling which can help make the lesson more memorable. As previously mentioned, learning outdoors is good for students because they become more engaged. If the school already has a compost heap or a worm farm, it’s an ideal hands-on experience for the students to learn about how it works and the types of things that can be put into it. Lake Macquarie Skips believes in the Recycling Revolution. We believe that education is the most essential aspect to living an efficient and environmentally-friendly lifestyle. If you want to get started with your recycling journey whether in school or at your home, Lake Macquarie Skips have several skip bin sizes for hire that will suit your requirement. We have mini skip bins that can accommodate all types of wastes and can fit anywhere and large walk-in skip bins with rear opening doors for large residential clean-ups. Call 0452 22 55 88 to learn more about how we can help you.